On the same day, Facebook bought ads in U.S. and British newspapers to apologize for the Cambridge Analytica scandal, the social media site faced new questions about collecting phone numbers and text messages from Android devices. The website Ars Technica reported that users who checked data gathered by Facebook on them found that it had years of contact names, telephone numbers, call lengths and text messages. Facebook said Sunday the information is uploaded to secure servers and comes only from Android users who opt-in to allow it. Spokeswomen say the data is not sold or shared with users’ friends or outside apps. They say the data is used “to improve people’s experience across Facebook” by helping to connect with others. The company’s response to the Ars Technica story, however, struck a different tone, with Facebook titling the post “Fact Check: Your Call and SMS History.” It said “You may have seen some recent reports that Facebook has been logging people’s call and SMS (text) history without their permission. This is not the case,” before going on to explain that call and text history logging is included with an opt-in feature on Messenger or Facebook Lite for Android that “people have to expressly agree to use” and that they can turn off at any time, which would also delete any call and text data shared with that app. 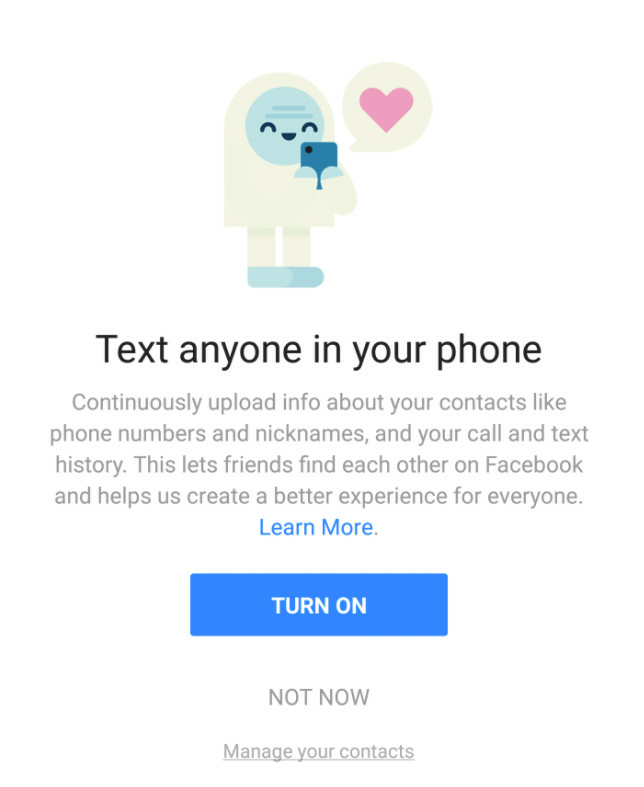 When you sign up for Messenger or Facebook Lite on Android, or log into Messenger on an Android device, you are given the option to continuously upload your contacts as well as your call and text history. For Messenger, you can either turn it on, choose ‘learn more’ or ‘not now’. On Facebook Lite, the options are to turn it on or ‘skip’. If you chose to turn this feature on, we will begin to continuously log this information, which can be downloaded at any time using the Download Your Information tool. Facebook’s privacy practices have come under fire after Cambridge Analytica, a Trump-affiliated political consulting firm, got data inappropriately. The social media platform’s stock value has dropped over $70 billion since the revelations were first published. Among the newspapers with the ads were The New York Times and The Washington Post in the U.S., and The Sunday Times and The Sunday Telegraph in the United Kingdom. The ads said Facebook is limiting the data apps received when users sign in. It’s also investigating every app that had access to large amounts of data. “We expect there are others. And when we find them, we will ban them and tell everyone affected,” the ads stated. Cambridge Analytica got the data from a researcher who paid 270,000 Facebook users to complete a psychological profile quiz back in 2014. But the quiz gathered information on their friends as well, bringing the total number of people affected to about 50 million.